Summer Course on Tropical Aquatic Bio Invasion: Ecological and Socio-economical Impacts. 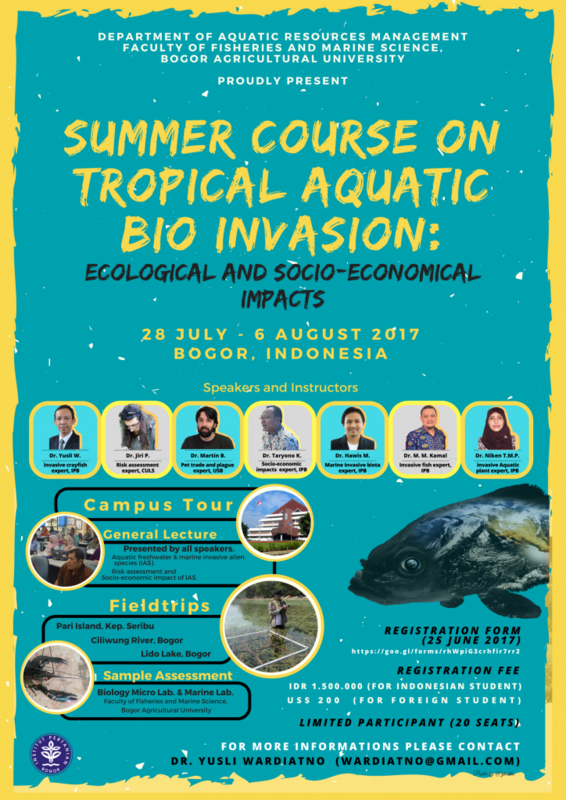 Department of Aquatic Resources Management proudly present The Summer Course on Tropical Aquatic Bio Invasion: Ecological and Socio-economic Impacts. Summer Course will be held in 28 July – 6 August 2017. This event will be held in ten days with Campus Tour, General Lecture, Fieldtrip, and Sample Assessment Programee. Each topic will be guide by experts and instructors. The experts and instructors are from worldwide, include two Cezch Republic’s Researchers and five Indonesian Researchers. Pari Island (Participants will be invited to observe the tropical coastal water with coral reef ecosystems). Several types of organisms will be assessed in the laboratory. Participants will be invited to observe the characteristics and habits of the organisms to find out which aspects has the potential to become invasive. Online Registration is closed on June 25, 2017. Participants who pass the selection will be informed via email on July 1, 2017. Payment, selected participants are have to to pay the registration fee (IDR 1,500,000 for participants from Indonesia and US $ 200 for overseas participants).